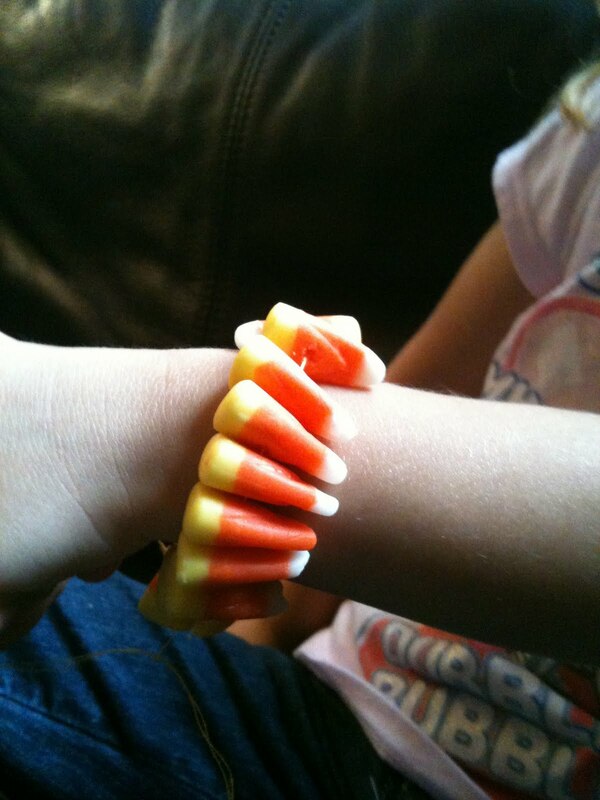 While jewelry may be nice, jewelry that tastes delicious is even better, which is why these candy corn bracelets are so awesome! I originally saw these on the Chica and Jo site and new that the Bee would be all about this projects. Making them was very easy, start by buying large candy corns, the bigger they are the easier they are to use. Use a larger needle, like a tapestry needle, and either thread or a thin fishing line. I used regular thread doubled over and it worked great. Push the needle through the center of the candy corn, the closer you are to the center the less likely it is to crack, and repeat until you have enough candy corns for the length bracelet (or necklace) that you want. The Bee's wrist is pretty little so it didn't take to many, then tie it and eat!